Running is an accessible sport that allows you stay active while saving some money. Of course, one of the biggest requirements for runners is the space to run. That could mean open space, like parks and trails, but it could also mean a gym. If you’re a runner it’s also nice to have a supportive community. In addition, many cities have road races and races for charity. We considered all of this and more to find the best cities in the U.S. for runners. We ran the data on 98 cities to find the best cities for runners. The eight factors we looked at were the number of races per 10,000 residents, walkability, how many workers walk to work, pedestrian safety, housing costs as a percentage of income, the number of gyms per 10,000 residents, the percentage of a city covered by parkland and the percentage of residents with access to a park. You can learn more about where we got this data and how we put it together in the data and methodology section below. 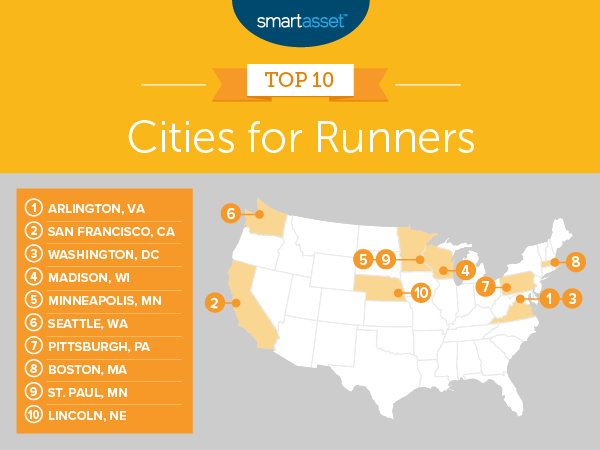 This is SmartAsset’s third annual study on the best cities for runners. Read the 2018 study here. Consistency at the top. Nine of last year’s top 10 cities made the top 10 again this year. The only city to drop out of the top 10, Denver, Colorado, didn’t move far in the rankings, though. It’s number 11 this year. Taking its place was last year’s No. 12 city, Lincoln, Nebraska. Big differences between the top 10 and bottom 10. Approximately 94% of residents across the top 10 cities live within a 10-minute walk of a park. Only about 52% of residents in the bottom 10 are that close to a park. The top 10 cities are also nearly twice as walkable as the bottom 10 cities. Residents seem to take advantage of this. Across the top 10, the percentage of the workforce that walks to work is almost 9%. By contrast, the average percent of the workforce that walks to work for the bottom 10 cities is only about 1%. On top of that, the pedestrian death rate is more than twice as high in the bottom 10 as it is in the top 10 cities. Texas and Arizona struggle. Fourteen of the bottom 25 cities are in Texas or Arizona. Texas has eight of the bottom 25 cities, while Arizona has six. Arlington, Virginia is our best city for runners in this year’s study. Arlington has more races per 10,000 residents than any other city in our study. And residents who want to participate in races have places to train. Almost all residents live within a 10-minute walk to a park. If you prefer to run indoors, the city also offers the third-highest number of gyms per 10,000 residents. Beyond being a great locale for running, Arlington is also a very livable city. It ranked ninth in the study for lowest housing costs as a percentage of income and 16th for walkability. San Francisco, California, which tied for third last year, claims the No. 2 spot this year. Park access is one factor that helps it do so. Data shows that the city has the 11th highest area of parkland. And according to data from the Trust for Public Land, all residents live within a 10-minute walk of a park. No other city in our study can claim that. But parks aren’t the only destination to which San Francisco’s residents are walking. The city has the third-highest walkability in our study, as well as the third-highest percentage of the workforce that walks to work. Finally, San Francisco had top-15 scores for both the number of races and the number of gyms in this study. An impressive 12.69% of the workforce in Washington, D.C. walks to work. That’s the second-highest percentage we found. D.C. has the ninth-highest walk score overall, at 77.30. And if you’re going out for a jog, there’s also plenty of greenery to admire. Almost 22% of the city is parkland, a top-10 rate. Our data shows that 98% of residents live within a 10-minute walk of a park, so there’s plenty of opportunity to get some exercise even if the most common form of running in the nation’s capital is for office. Additionally, Washington, D.C. has the eighth-highest number of races per 10,000 residents. As the city is also one of the best places for women in tech, a jog could be a great way to blow off steam while tackling a demanding job. Madison, Wisconsin ranks in the top 10 for four of our eight metrics. It offers the seventh-highest number of races with lots of parkland and gyms where runners can train. It has the second-highest number of gyms per 10,000 residents. Nearly 10% of the workforce in Madison walks to work, which is the ninth-highest rate in the study for this metric. The Wisconsin city is also a safe place for walkers and runners, with the third-lowest number of pedestrian deaths. If you’re trying to avoid roads, 13.50% of the city is parkland. Plus, almost all residents have access to that land, with 90% of them living within a 10-minute walk of a park. All of these could be factors that contribute to why Madison is also a great place for workers seeking work-life balance. Minneapolis, Minnesota, a prime destination for millennials, is also a great city for runners. We found that 97% of residents live within 10 minutes of a park. That’s the sixth-highest rate in the study for this metric, and one factor could be that 15% of the city is parkland. For those trying to add steps outside of their morning jogs, Minneapolis had the 15th-highest walk score of the 98 cities we considered. People seem to take advantage of the city’s walkability, with 6.53% of the workforce walking to work. That’s a top-15 rate. Walking is also pretty safe here, with the sixth-lowest rate of pedestrian deaths. Though if you do prefer to get your walking done indoors, know that the city also has the 10th highest number of gyms per 10,000 residents. Seattle, Washington is 12.5% parkland. That allows 94% of Emerald City residents to live within 10 minutes of a park. That’s the ninth-highest percentage of residents with access to a park. The parkland may contribute to the city’s walk score of 73.10. Only nine cities in our study have a higher walk score. More than 10% of the workforce walks to work, and the pedestrian fatality rate is also relatively low, giving Seattle two more top-10 scores. Runners will also enjoy that Seattle ranks in the top 20 for number of races (2.15) per 10,000 residents. Just make sure you don’t reverse the results of your training by sipping one too many IPAs in this great city for beer lovers. Almost 11% of the Pittsburgh, Pennsylvania workforce walks to work. That’s the fifth-highest rate in the study. Pittsburgh has a top-25 rate for both walkability and pedestrian safety. This is a great city for competitive runners thanks to the fact that it has the 12th-highest number of races per 10,000 residents. If you need a place to train for an upcoming race, consider a Pittsburgh park. More than 10% of the city is parkland, and 84% of residents live within a 10-minute walk of a park. When the weather isn’t as nice, you’ll be happy to know that the city has the 13th-highest number of gyms (per 10,000 residents) of all the cities in our analysis. Of course all of this is only one reason that Pittsburgh is one of the most undervalued cities in America. More than 14% of the Boston, Massachusetts workforce walks to work. That’s the highest rate in the study. Beantown’s walkability score of 80.90 gives it the fourth-highest walk score in the study. You’ll probably pass by a park on your walk to work, since 17.40% of the city is parkland, a top-20 rate. If you want to visit a park, you’ll be happy to know that you almost certainly live within a 10-minute walk of one. A staggering 99% of residents do. That’s second-highest in the study, behind only San Francisco. Boston offers relatively few races at just 1.26 per 10,000 residents, but of course it is home to one of the nation’s most well-known races: the Boston Marathon. Much like its No. 5-ranked twin city, St. Paul, Minnesota is about 15% parkland. That allows 96% of residents to live within 10 minutes of park. Only seven cities offer residents better access to parks. 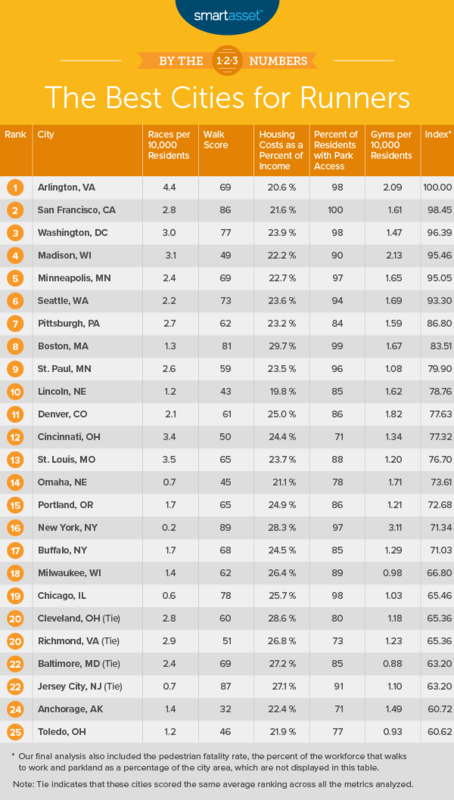 Like Minneapolis, St. Paul is also one of the safest places on this list for pedestrians. It has the sixth-lowest rate of pedestrian deaths. Safety is an important concern when close to 4% of your workforce is walking to work. The other good news for runners is that St. Paul offers 2.6 races per 10,000 residents. That’s the 13th-highest rate in the study. About 7% of Lincoln, Nebraska is parkland. That’s low by the standards of this top 10, but it’s still enough to put 85% of city residents within 10 minutes of a park. That’s a top-20 score. Additionally, 3.15% of the workforce walks to work. If you do plan to walk, you’ll appreciate that Lincoln is tied for the lowest pedestrian fatality rate in our analysis. Beyond just offering parks and the 11th-highest number of gyms to runners, Lincoln is also an affordable place to live. When considering housing costs as a percent of the median income, the city ranks fifth best. This isn’t the first time we’ve looked at Lincoln’s affordability either. We recently found that it’s one of the best cities to live on a $55,000 salary. Walk score. This is a measure of a city’s overall walkability. Data comes from walkscore.com. Percentage of workforce that walks to work. Data comes from the Census Bureau’s 2017 1-year American Community Survey. Pedestrian fatality rate. This is the number of pedestrians killed in automobile accidents per 100,000 residents. Data comes from the National Highway Traffic Safety Administration, is for 2016 and is measured at the state level. Gyms per 10,000 residents. This is the number of gyms per 10,000 residents. Data comes from the Census Bureau’s 2016 County Business Patterns survey. Races per 10,000 residents. Races include all 5ks, 10ks, half-marathons, marathons and ultra-marathons that take place in the city. Data on races comes from runningintheusa.com and population data comes from the Census Bureau’s 2017 1-year American Community Survey. Percentage of city that is parkland. This is the total adjusted city area divided by total parkland measured in acres. Data comes from the Trust for Public Land. Percentage of residents who live within a 10-minute walk of a park. Data comes from the Trust for Public Land. Housing cost as a percent of income. This is the amount of annual median housing costs divided by median household income. It was included in this study as a measure of affordability. Data comes from the Census Bureau’s 2017 1-year American Community Survey. We ranked each city in each metric and gave equal weight to each metric. Then we found each city’s average ranking. Using this average ranking we created our final score. The city with the best average ranking received a 100. The city with the worst average ranking received a 0. Improve your credit before buying. Your credit score plays a big part in the mortgage rates that lenders will offer you. If you want to help yourself get a good rate and save money over the long term, focus on your credit score before buying a home. Make as large a down payment as you can. The larger your down payment, the smaller your mortgage. So if you want to help yourself avoid larger interest payments over the life of your mortgage, make as big a down payment as possible. The old benchmark is 20% but it’s all right if you don’t have that much. Many mortgage lenders will accept down payments as low as 3.50%. Just keep in mind that you will probably pay insurance if you put down less than 20%. The closer you get to 20%, the more you can potentially save. Don’t overspend. When it comes to your down payment and to your home in general, it’s important to know how much house you can afford. If you overspend, you will only put yourself deeper into debt. And make sure that you consider some of the other costs that go into buying a home, like closing costs. Get a second opinion. If you need help understanding how much you can afford and the ideal time for you to buy, consider speaking with an expert. A financial advisor can look over your entire situation with you to determine whether buying a home is the right choice at this point in your life. And that includes a holistic look at your other goals, like saving for retirement or planning for a family. To help you find an advisor, start with this free financial advisor matching tool. It’ll show you which advisors are in your area and give you information about them, so you know what to expect if you choose to work with one. The post Best Cities for Runners 2019 Edition appeared first on SmartAsset Blog.